ROSEBURG, Ore. — A pastor says that his daughter survived the campus shooting in Oregon last week after a student who was shot fell on her, covering her body as he died. Randy Scroggins of New Beginnings Church of God spoke to reporters over the weekend as he shared his daughter Lacey’s story with the world. Lacey Scroggins, 18, was attending Umpqua Community College to become a nurse. She was present on Thursday when classmate Christopher Harper-Mercer, 26, walked into writing class with a gun and ordered everyone on the ground. At first, Scroggins thought the incident was a drill, but when she realized that her teacher had fallen dead, she knew something was terribly wrong. “And his body dropped to the ground, and I realized this is not a drill any longer,” her father explained as he relayed his daughter’s words to the Los Angeles Times. Scroggins then heard Harper-Mercer call out to a student. “You, in the orange shirt. Stand up. What religion are you? Are you a Christian?” he asked. She then heard the student fall to the floor, and Harper-Mercer continued asking the question of others, shooting some dead. After singling out Christians in the room, Harper-Mercer ordered those still alive to the middle of the room. 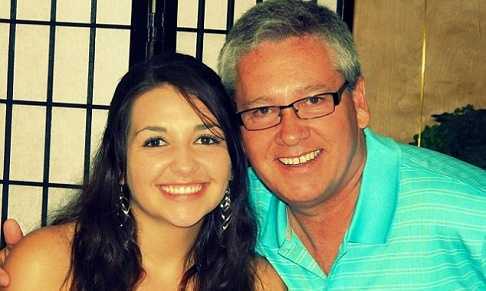 “And then he walked over, Daddy, and he began to shoot,” Scroggins recalled his daughter saying. One of the students that was struck, Treven Anspach, 20, fell on top of Scroggins, pinning her to the floor and drenching her with blood. Moments later, Harper-Mercer ordered Scroggins to stand, but she played dead. When the girl replied that she didn’t know, Harper-Mercer moved on. As police closed in, the gunman then shot himself, and Scroggins stood minutes later and began to assist her fellow classmates. Her father says that he believes that Anspach protected Scroggins with his dying breath. “We all believe with the last piece of effort that [Treven] had, that he moved on top of her on purpose,” Scroggins told reporters.